I was about ten years old when a Southern Baptist Missionary told me about the American Dream. I was told that there is a place called USA where if you work hard, play by the rule, and keep your nose clean, you can be anything that you want to be. 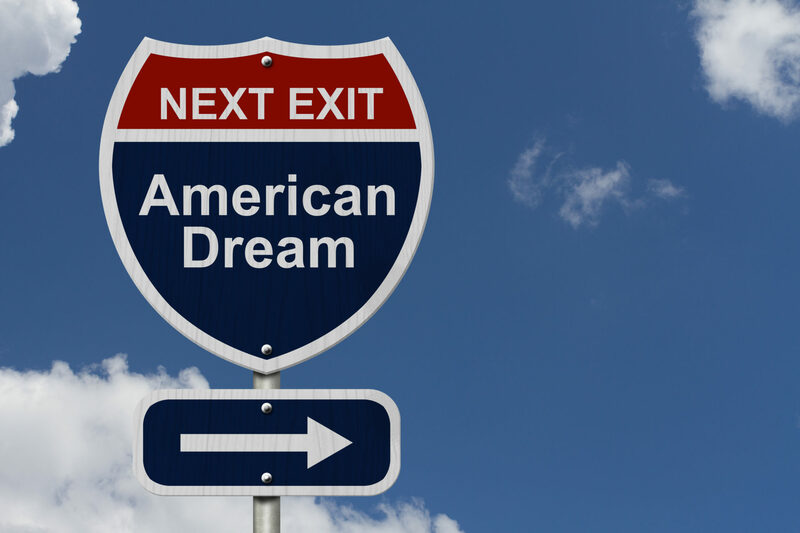 Some people may argue that the idea of the American dream is just a myth. Well, whether it is a myth or not, I don’t know. But what I do know is that I am living the American Dream and I strongly believe that anyone in the USA can do the same. Now, let me elaborate. One of the best things that can happen to anyone is to be born in USA. It is a land of freedom, opportunity, aspiration and possibilities. Even for folks like me who was not born in USA, we are equally fortunate and proud to be an American. However, being an American is an opportunity that comes with responsibility. A person who embraces freedom and opportunity with no responsibility is a time bomb waiting to explode. But if anyone dares to seize the opportunity and accept the responsibility that comes with it, he or she will make it big in the good old USA. Regrettably, the same thing is not true in many countries. So, God bless the USA. Now, do not get me wrong. I am not suggesting that the American Dream is easy or cheap. In fact, the road to it may be rough, tough, rocky and full of uncertainties, but the courage to face your uncertainties or take the risk is part of being American. So, you can react to life’s uncertainties either positively or negatively. It is up to you. Do you remember the story of David in the Bible? Likewise, if you have the guts to face your Goliath in life, you are more than likely going to be a success story in America. Yes, you may have to go through some tough times, hardships and failures, but if you have a compelling vision, combined with a heart of dedication and commitment that is mixed with hard work, and you keep your nose clean, you will make it in USA. What do I mean when I say keep your nose clean? It means that you must try your best to always do the right thing. For example, do not drop out of school, do not commit crime, do not get pregnant until you are matured enough to be a parent and you have basic means to take care of the child, do not father a child when you know that you do not have the resources to take care of the child, do not hang around bad people, etc; In short, do your best to stay out of trouble. However, if you have messed up already, God is a God of another chance. If you have fallen, you can always get back up. As long as you are an American, the American Dream remained available to you. The challenge for our generation is that many people wants freedom with little or no responsibility. More so, our safety net or our support system such as good family, good home, good church, good school are no longer as good as it use to be. Yet, that should not be an excuse not to live the American Dream. I admonish you to find out your purpose in life, develop a passion for it, set high standards for yourself to achieve your goals, develop the commitment and dedication to achieve your purpose in life and go after it. In addition, be persistent and never give up. You have to learn to keep going when others are murmuring, complaining or quitting. Life is like a blank page when everyone is born. Each person has the responsibility to fill in the blank during his or her life time. My own page started on March 27, 1959 in a small town in Nigeria, West Africa. I dreamed of going to school, pursuing a career of my choice, getting a job, having a family and making a serious impact in the lives of others. My passion is to encourage, motivate and inspire others to succeed. I thank God that I had people in my life who reinforced the importance of hard work, good behavior, right association, and the fear of God. If you have children, teach them about the value of hard work, dedication, commitment, sacrifice, integrity and responsibility. Those are some of the basic requirement to enjoy the American Dream. What is the message? Do not become an outsider in your own country. The American Dream is real and it is not a thing of the past. Go after your dream, make the tough choices and develop the courage to pursue your goal. If you do, the likelihood will be that you will survive all the odds, and live the life you have always wanted to live. How do I know? It is because I am living it. I will admit that when I came to this country it was not easy being a foreigner or an outsider, and it was not easy trying to survive with no support system. If the truth be told, not only was it not easy but it was also not cheap. There were many sacrifices and tears along the way, but I am who I am today by the grace of God, and my willingness to embrace the American opportunity along with the responsibility that comes with it. So, if you want to partake in the American Dream, you must be willing to identify what you really want to do in life, and have the audacity and the drive to pursue it. Once again, let me remind you that a full and prosperous life is available to all Americans. I encourage you to please take advantage of the opportunity, do not waste it and do not quit in the middle of the game. Accept the responsibility to win in life and be successful. If you do, I will see you at the TOP!